There has been a lot of chatter in the macspere over the past several months about the exciting potential of new graphics technologies that are coming (or might be coming) to OS X. This post will seek to give information on each of the major four graphics API's, talk about that advantages of each, which ones are coming to OS X, and other information. What are the Major API's? Historically, there have been two major API's: DirectX and OpenGL. DirectX has always been locked down to Microsoft systems (Windows OS and Xbox), whereas OpenGL runs on pretty much everything (Windows, Mac, Linux, Playstation, etc.). In OS X, OpenGL has been the only graphics API for years now. Recently, several new API's have popped up that promise better performance over what was capable with OpenGL and DirectX. Vulkan is an upcoming graphics API that is compatible with all platforms and has widespread industry support from titans such Intel, AMD, Nvidia, Valve, Apple, Sony, etc.. It was originally speculated that Apple will support Vulkan in OS X, although that is looking less likely now (more on that below). Metal is another graphics API that has been developed by Apple in order to allow developers of iOS and Mac applications to get better performance from the hardware. Metal began as iOS only, but Apple has brought it to OS X and we know for a fact that at least some major developers such as Blizzard and Epic are going to support it. Since DirectX is locked to Microsoft platforms I will not be discussing it in this article. If you want to learn more about I would head over to its Wikipedia page. OpenGL has been the graphics API that Apple has used for years, and up until El Capitan it was the only API that could be used (El Capitan brought support for Metal). Despite relying on OpenGL, Apple has always been slow to update its OpenGL support with the latest features. The release of El Capitan is no different. El Capitan supports the exact same version of OpenGl that both Mavericks and Yosemite do: OpenGL 4.1 (with a few 4.2 extensions added in). OpenGL 4.1 was finalized in 2010, so Apple's (lack of) support for it is puzzling to say that least and doesn't bode well for them to support other API's like Vulkan (OpenGL is currently at version 4.5). Newer versions bring in new features and optimize existing features. In regards to performance, OpenGL is a very capable API that can rival the performance and features of DirectX when used properly. Unfortunately for OpenGL, nearly all games are designed first using DirectX and then ported over to OpenGL later. This almost always results in a performance loss of up to 50%. Games that are developed using OpenGL from the beginning will see similar performance in both OS X and Windows. ID Software (Enemy Territory: Quake Wars, Doom 3, RAGE) has used OpenGL for its games in the past. All major games on OS X currently use OpenGL. Metal is still in its junior stages on both OS X and iPhone and will likely see much-expanded support in coming years. Blizzard has committed to using Metal for its games in OS X, but none of them have been updated with Metal support as of yet. You'll notice that Metal wins some benchmarks, while OpenGL wins others. I would expect that Metal performance should increase as times goes on, but that is speculation on my part. OpenGL is a known quantity at this point, whereas metal can be a much more efficient API with the right programming and effort. Metal isn't going to give an Intel Integrated GPU the performance of a discrete GPU on OpenGL, but it does have the potential to give a slight boost in framerates. The Foundry - Confirmed to be supporting Metal. Timeline unknown. Autodesk - Confirmed to be working on Metal support. Timeline unknown. Adobe: Adobe has committed to bringing Metal support to all its Mac OS Creative Cloud applications. Timeline unknown. Given Apple's track record with OpenGL, its new focus on Metal; it is my personal speculation that Vulkan will not be supported in OS X in the near future. Perhaps in a few years once Vulkan has had some additional development time and Apple sees how support for the new API plays out in the real world. The Vulkan 1.0 release was scheduled for 2015, but has missed that target. Khronos Group states thatit's release is 'imminent'. That is a difficult question to answer as we have not yet seen all of them in action. Vulkan is the successor to AMD's Mantle API, which gave a performance boost over DirectX (Battlefield 4: Mantle vs DirectX), but Vulkan is expected to be much more refined than Mantle and give even greater performance boosts. That said, there are no official numbers to go off of for Vulkan, so any performance estimates would be pure speculation. At the moment, there are only two API options for OS X: OpenGL and Metal. Of those two, Metal offers better theoretical performance, making it the best OS X graphics API as of the time of writing this. If you have any questions, comments or disagreements feel free to comment below. I will be responding the comment section. UPDATE: I've edited the article slightly as the original version made some claims about Apple's relationship to Vulkan that I could not find any sources for. I apologize for misleading readers. Why did Apple choose to develop Metal instead of going with Vulkan? I wish I knew. Apple has almost always preferred to have full control over all systems, but a graphics API seems like a strange thing to try and be unique on. Metal is a very powerful API and I wish it the best, but Vulkan will almost certainly see much better support from developers and faster updates/new features. There's nothing stopping Apple from having both Metal and Vulkan, but I doubt that will be the case. Bingo. I think this is it including very possibly changing the CPU architecture of the Mac line in time. I sense that offering Windows compatibility at one point made good business sense for Apple but that it has become increasingly less important as a part of their overall focus and related business plan moving ahead. For example, in the business world such as their relationship with IBM, odds are any legacy Windows software is better run in VMware anyway. I don't see business users rebooting Macs to run some legacy Windows app. On the consumer side of things the growth of Mac gaming options along with long term plans for ever more capable Metal games across the ecosystem I think means that from Apple's perspective, spending resources to support Windows with drivers, etc. and also very importantly being tied to Intel for processors is not something they want to do for the long haul. I doubt it would impact sales of Macs much when it happens keeping in mind that core gamers are probably a very small minority of the total installed base of Mac computers. They have to be really since so few of them can run AAA games well or at all even now. Everyone in my family uses Apple stuff and some use Macs including both of my daughters. Not a one of them plays anything other than a casual iOS game here or there if that. I am the only one that likes gaming. My nephews do too but they own a XBox One and PS4 and do their homework on cheap PC notebooks which are not able to play games at all. Come to think of it, one of my nephews does have an aging desktop PC but even with access to my entire Steam library I notice he rarely uses it. Even when I gave him some good games, he never played them. He's too busy playing stuff like Fallout 4 and CoD Black OPS III on his XBox to care about an old PC. Aside of Metal, the API's are irrelevant when it comes to Apple computers. Metal is the only thing that is going to see active development now going forward and ultimately OpenGL will be deprecated. Everything will use Metal or bust. It'll be a while for this transition to take place but the signs of what is coming seem pretty obvious to me. Very nice reading, thanks! I think metal is going to be huge, but probably will be much more refined in 10.12. I've red somewhere that some devi are having troubles supporting metal. If they decided to go with Vulkan suddenly the API would become very relevant. The main barrier to games being on Mac is the fact that 99% of games are created for DirectX. Porting that game/engine over to OpenGL is the majority of the work for Feral/Aspyr. Assuming the industry transitions to Vulkan, and OS X supported Vulkan, it would be trivial for games to be supported and released on both PC and Mac simultaneously. I just want Borderlands 2 on my iPad. I would consider replacing my delectable 2012 MBP with an iPad or iPad pro if Borderlands was available. 600 games and all I am play is borderlands. You'd play with a controller I'm assuming? I always play with a controller. IMO it's only recently that there is finally an uptick in MFI controller compatible games that iOS gaming can handle anything more than match 3 games. I have a manpurse that carries all my junk from day to day (including a 3DS), but if I take my laptop I have to grab my backpack. If I could just have Borderlands in my bag 24/7 I would be real pleased. iOS has matured enough to handle day to day work tasks and the graphics power is there, I just want more than freemium match 3 games. But people are also unwilling to spend more than .99 on iOS games so I'm probably the only one that would pay a respectable amount for a release of Borderlands on iOS. Also the first generation of MFI controllers really sucked but the MadCatz C.T.R.L.i looks solid and is styled after the second best controller ever made, the 360 pad. I won't hold out for an MFI Gamecube pad. Awesome post! Great overview of API's and where they stand now Here's hoping to see some developments here in 2016 with Metal or Vulkan. I'm wondering though, how do you know Firewatch will use/support Metal? I know of the game, but didn't see that mentioned. When Apple introduced Metal (for iOS), Vulkan was nothing but a gleam in the Khronos Group's eyes. It didn't even bear this name at this time. There's still no fully finished specification for it. That was mentioned during the WWDC. Campo Santo, the developer of Firewatch, is shown on the picture in the original post as one of the companies supporting Metal for Mac. They also tweeted it. I find it hard to imagine that Apple will support anything but Metal on OS X in the future myself. As Metal matures I'd expect the porting of PC games to Mac to be approximately similar to the situation now. Meantime, I'd also expect iOS games to become increasingly sophisticated over time as well. There are already some noteworthy iOS games I can think of off the top of my head and I don't even game there, yet anyway. I am thinking of the HD remakes of Infinity Engine games. Not sure if they released all three of them for iOS yet but I recall at least BG Enhanced getting an iOS release for iPads. Aspyr did KOTOR I believe. I think games like that are just the beginning of what's to come with iOS even though the simple time wasters will remain quite popular and profitable. I think from a business perspective, staying the current apparent course makes a lot of sense for Apple. Why should they care about supporting another API and the costs that entails when the core gaming percent of Mac owners is so small? I don't think the money's there and it would seem that they don't think so either or else they'd have put a lot more effort into this before now. I think what people wrestle with over and over is that Apple has no intention of trying to be all things to all people all of the time. They try to choose areas of focus and excel in those areas. This strategy certainly seems to be working for them. I have an iPhone 6S and tested an iPad Pro in our local Apple Store today with several Metal games like the F-Zero inspired AG Drive. iOS devices have come a long way: Games perform insanely good on recent devices. Both AG Drive and Horizon Chase run at a constant 60 FPS and look spectacular. KotOR runs better on my iPhone than on my 12-inch MacBook or the last few iMacs I've owned (granted, Aspyr had some performance problems with certain gfx cards). Give me an ARM-powered Apple-A-Chip over any Atom or Core M CPU with their crap integrated graphics. 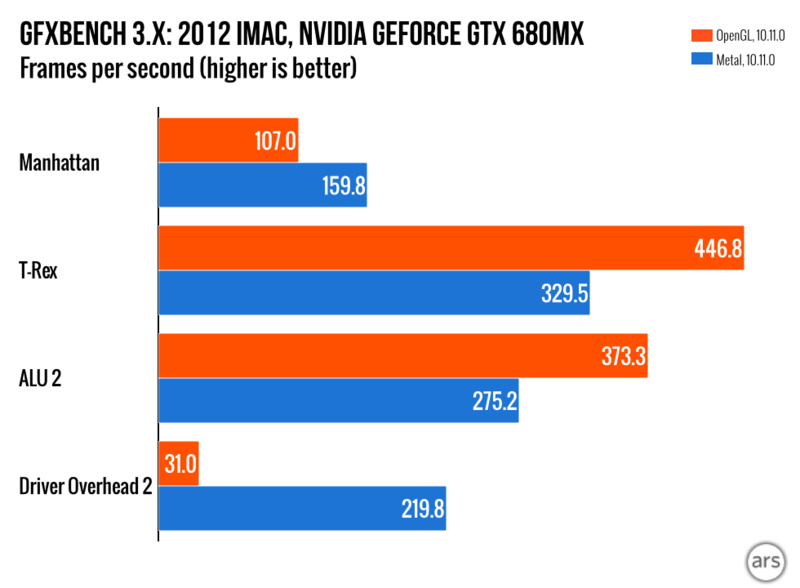 Apples A9(x) runs games better than the Intel HD 5300 or Iris (non Pro) chips in the recent MacBook (Pro). And there's tons of them, including a lot of remasters or re-releases of older classics such as the GTA series, Final Fantasy, etc. Welllll... not quite that level. IIRC the A9X has surpassed the PS3 and Xbox 360 in CPU compute performance, but GPU wise it's not even close. iPad Pro clocks something like ~160 FPS in T-Rex offscreen. PS3's RSX GPU does mid-900s. Got a little ways to go yet on the GPU. Probably get there sooner rather than later, though. NVIDIA's upcoming Pascal-based Tegra is able to put out just shy of Xbox One level power, nevermind Xbox 360; I can't imagine Apple and Qualcomm are going to let them maintain that kind of lead for long. Yea but they can fudge it a bit for my old eyes on a 5-10 inch screen. Now that I am finished with Bravely Default I am thinking of getting one of these (http://amzn.to/200ZeRj) and dropping it in my daily driver bag instead of my 3DS. A bag without a nintendo handheld in it. I'm getting all emotional. Seriously, might be tears. Actually, I'm retarded, after going back and searching, I see I misremembered. That was the PS4 that got ~950 with T-rex offscreen when running it with the same setup as the iPad Pro, not the PS3. Although now I'm questioning that, as that's in the same territory as the original Titan, which is a popsnizzleload more powerful than the PS4. I think that article I read was wrong. Looks like the HD7850, PS4's closest relative, gets about 355 FPS. Still about double the iPad Pro. But, getting closer there. On that note, I know the Pascal-based Tegra samples being shown at CES supposedly clocked in at almost Xbox One power. Looks like the current gen consoles are going to be obsolete fast. They were already barely competitive at launch with low-end PC hardware, and now mobile's on the cusp of passing them up. Ouch. Nintendo has a historical chance with the NX. If they play their cards right and release a hybrid of portable device and console with BETTER hardware than PS4 and Xbox One -- we're in for a treat. I still believe mobile and/or mobile technology in devices like the new Apple TV will play a leading role in the future of gaming. If everyone of us is carrying around a gaming device with PS4 level capabilities every day and we'll be able to stream games with 1080p/60 fps to every television -- who will still buy dedicated gaming systems such as consoles or PCs just to play FIFA or Madden or Candy Crush Saga? My answer: Nobody. A few enthusiasts, like us, will still remain -- but we'll be a minority within a minority. Uh, sounds like Mac gamers, right? Started by Sneaky Snake, 14 Jan 2016 opengl, vulkan, osx.